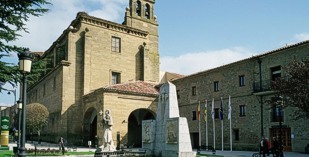 Parador Santo Domingo Bernardo de Fresneda is located in the region of La Rioja, northern Spain. The Parador is just 800 meters away from the historic center of Santo Domingo. This town has been related to the "Camino de Santiago", the route to St. James, since the 11th century, Calzada meaning pathway or trail. The town was named after a priest who dedicated his life to help and assist the pilgrims travelling to and from Santiago de Compostela in Galicia. His burial place became a centre of devotion and pilgrimage and through the centuries there have been many reports of miracles happening near his tomb. In the town's cathedral there are some paintings illustrating the saint's miracles. Santo Domingo de La Calzada is located in a vast plain, near the river Oja, which gives the name to the region and near the mountain "Sierra de la Demanda". The Santo Domingo Bernardo de Fresneda Parador is sited on the Convent of San Francisco, just a few hundred meters from the historic center of Santo Domingo de la Calzada. The convent was rebuilt in 1595 by Juan Herrera and is composed of three different sections, the church, museum-workshop and guest house. 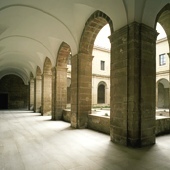 Now restored, the convent became an addition to the Parador group. Its location, design and historic significance make it an ideal and interesting place to stay. 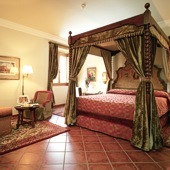 Accommodation consists of twenty three twin bedrooms, twenty two double bedrooms, one suite and one easy access bedroom. The Parador of Santo Domingo Bernardo de Fresneda has heating and air conditioning in meeting rooms and dining room, currency exchange, lift, telephone, mini bar in the rooms, conference room, satellite television and facilities for the disabled. The restaurant has a special gluten freemenu but specialises in the dishes of the area. The variety of the products and gastronomy of Rioja are a consequence of the differing landscapes and climate. The region has six natural areas some of which are protection areas for birds. This is also an area with many paths and waymarked routes, a paradise for walkers and nature lovers. Distance from the nearest airport is approximately 60 kms, train station is 17 kms away and the nearest port is 130 kms away. The restaurant and bar are now closed. 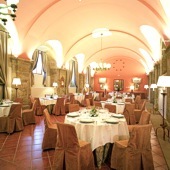 Guests can enjoy these services at the Parador Santo Domingo de la Calzada located only 800 mts away. Breakfast and event services will still be served at the Parador. This Parador is a terrific example of a wonderful old building offering modern accommodation. Entrance, reception and public rooms are majestic and peaceful. Bedroom beautiful. and so quiet. and breakfast wonderful. All staff pleasant, helpful and knowledgeable. Great stay. Notre séjour en période de Noël a été très agréable pour plusieurs raison : chambre spacieuse, très bien entretenue par le personnel d'étage (discrétion, politesse et efficacité,), le restaurant tant pour le petit déjeuner que pour le dîner est un lieu magique, les repas servis avec discrétion, sympathie et considération étaient de grande qualité gastronomique. Le jour de Noël c'était du haut niveau : tout était parfait... Seule note négative, nous étions peu de clients à avoir choisi de profiter de ce lieu superbe et envôutant que cet ancien monastère ... et assister à cette merveilleuse messe de Noël chantée par la chorale de Santo Domingo de la Calzada. Séjour inoubliable .... que nous vous recommandons très sincèrement. Merci au personnel. Really lovely room and breakfast, very calm and pleasant ambience and most interesting town. Parador hotel in the converted Convent of San Francisco.